By no choice of my husband’s, the grill has become my domain. His mistake was helping me to get over my irrational fear of turning on the gas grill (see How to: Turn on a Gas Grill if you know that fear well). I now wield the tongs like Annie Oakley wielded her six-shooter. I am one with the fire. As soon as the nice weather hits, I turn to barbecuing for about 75% of our meals. 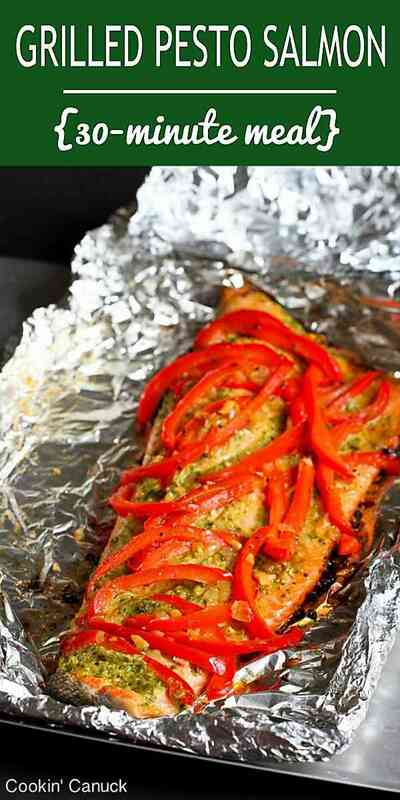 One of our favorites, thanks to my mum’s ingenuity, is Easy Grilled Salmon in Foil with Ginger & Soy Sauce. 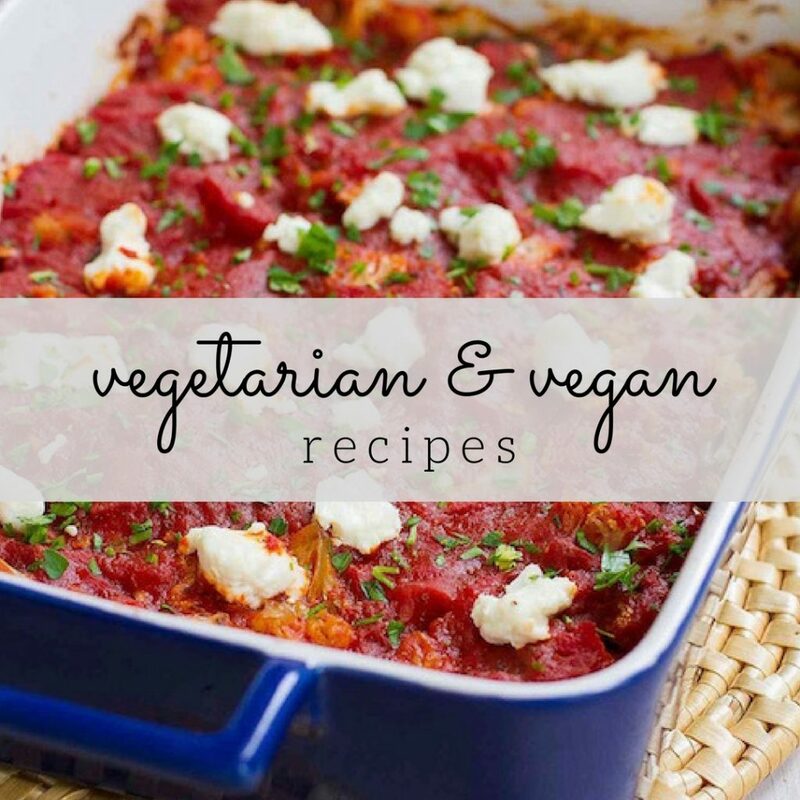 Since that recipe is always such a success, I used the same principles, but changed up the flavors with a dollop of basil pesto and some sauteed red bell peppers and shallots. And the leftovers? Killer on a pizza! That was my husband’s brilliant idea. 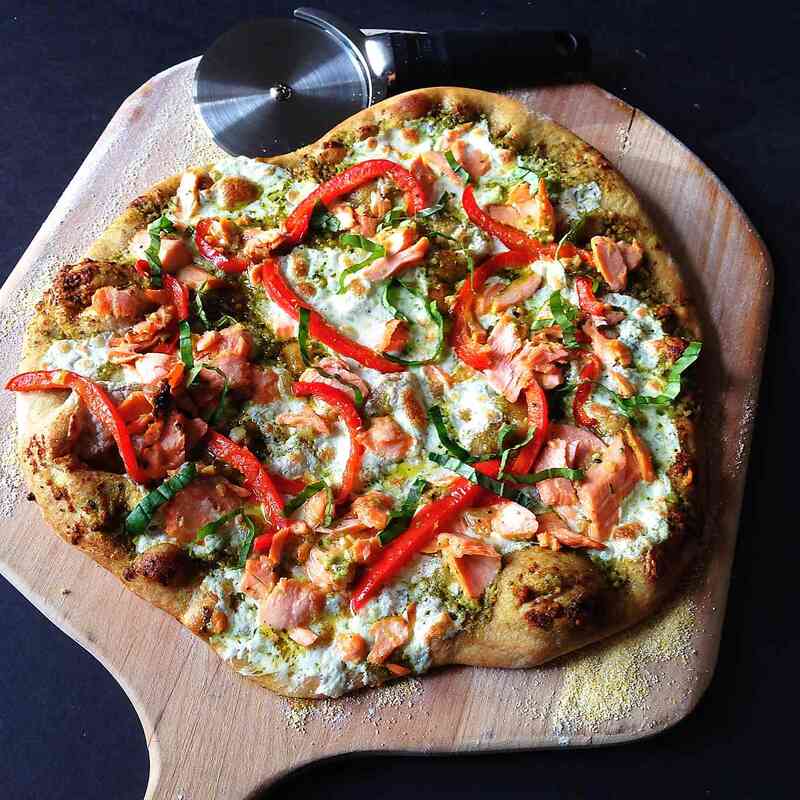 While the peppers and shallots are cooking, smear the piece of salmon with some homemade or store-bought basil pesto. 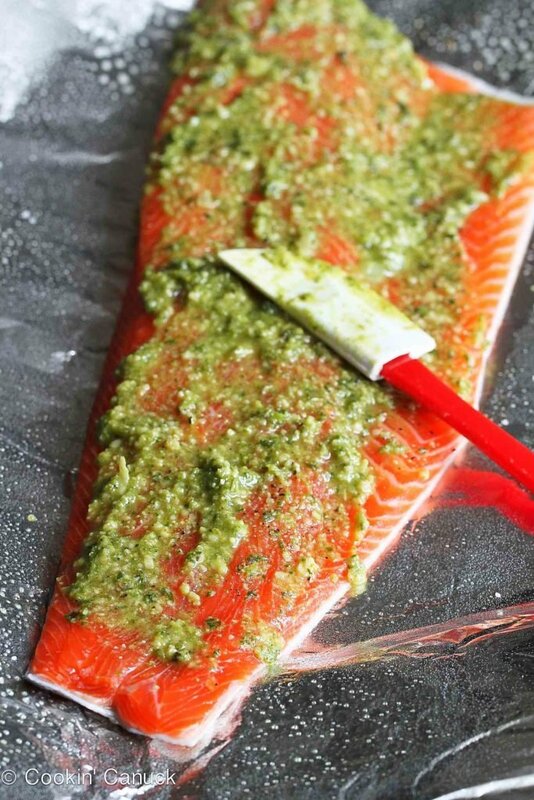 Make sure that you like the taste of the pesto you’re using because, besides the salmon itself, this is the essence of the recipe. 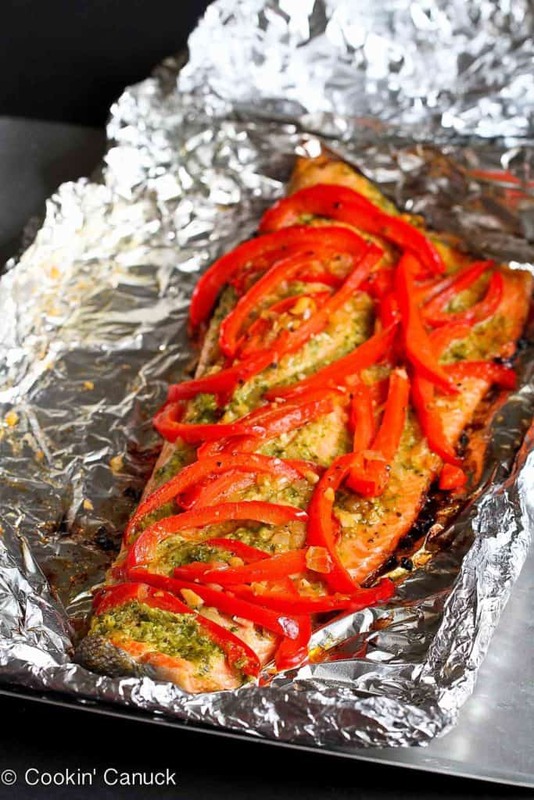 Cover the salmon with the sautéed peppers and shallots, and wrap it all in one pretty foil package. Ten to fifteen minutes later, you will be rewarded with a tender, flavorful meal. Easy, right? 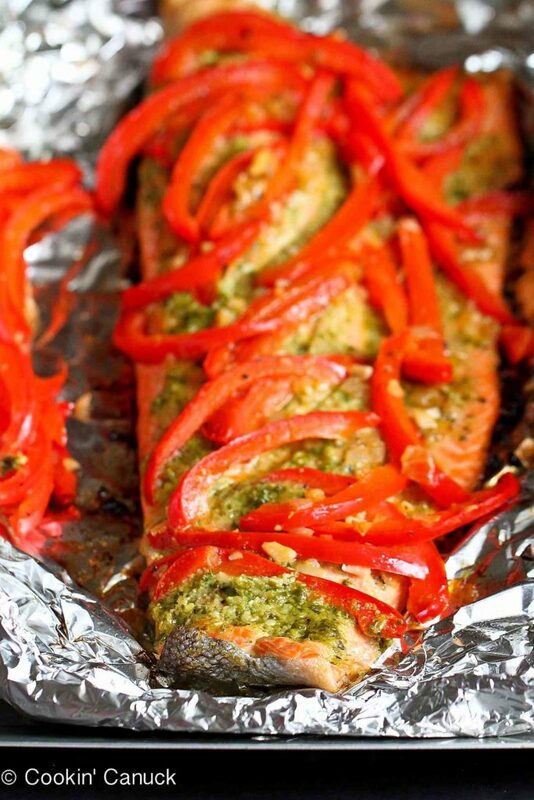 The biggest challenge in any salmon recipe (okay, any fish recipe at all) is taking care not to overcook the salmon. If have a little trick for you. Stick a small sharp knife into the thickest part of the salmon and hold it there for 10 seconds. Remove the knife and cautiously touch it to your upper lip (it’s very sensitive to temperature). If the knife is hot, the fish is done. Seriously, it works every time. It’s only 10:30am and my stomach is now grumbling for lunch! This salmon looks amazing!! Seriously wish I had some right now ! I love your tip for testing salmon on the grill!!!! Can I please come help you eat this? Great tip for testing salmon. Sooooooooooo often salmon/ fish is overcooked. Such a shame too. 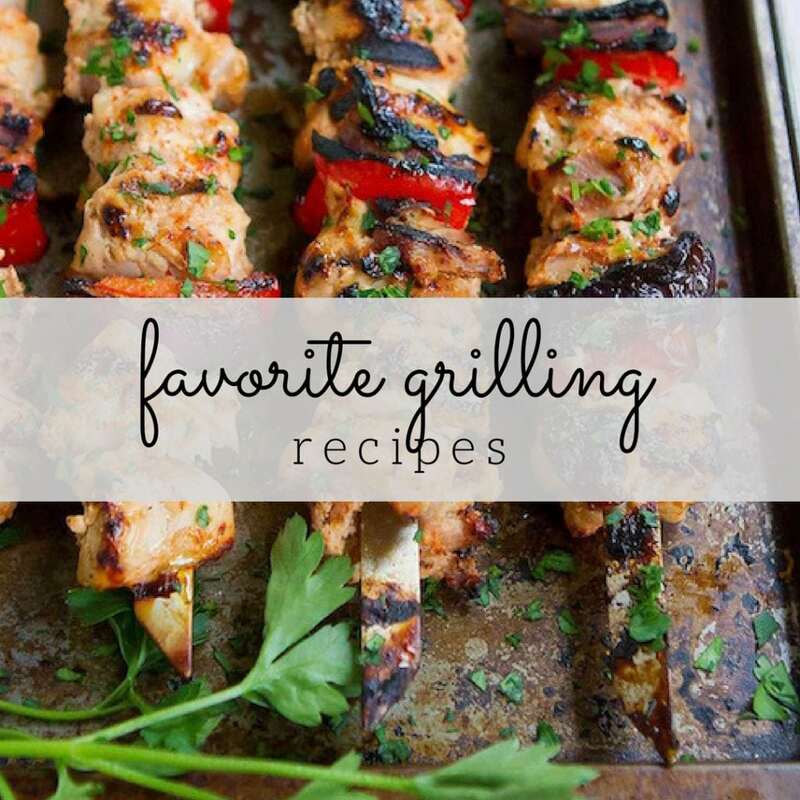 This is definitely quick and easy and keeps the grill clean too. Hi Dara, your amazing, I am so afraid of our grill, good for you. Love salmon, this sounds delicious! I just bought some salmon and was wondering about how to cook it. Get tired of same ol’ salmon. Thanks for this one. It is my supper tonite. Looks wonderful. 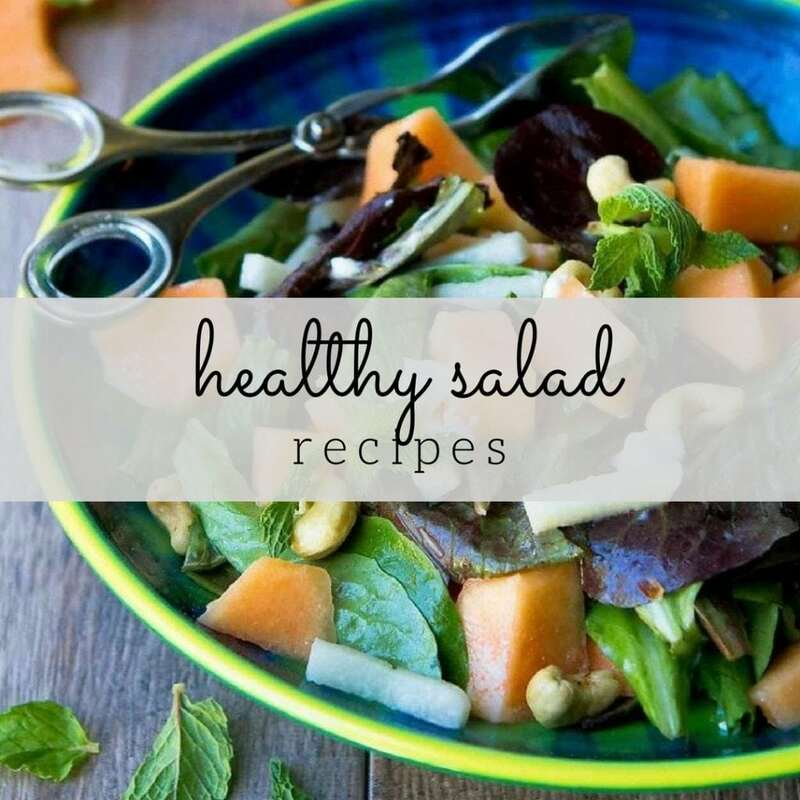 Great recipe and great tip for testing it! I’ll have to figure out a pesto sub so I can make this (can’t do parmesan or nuts these days, but will think of something). 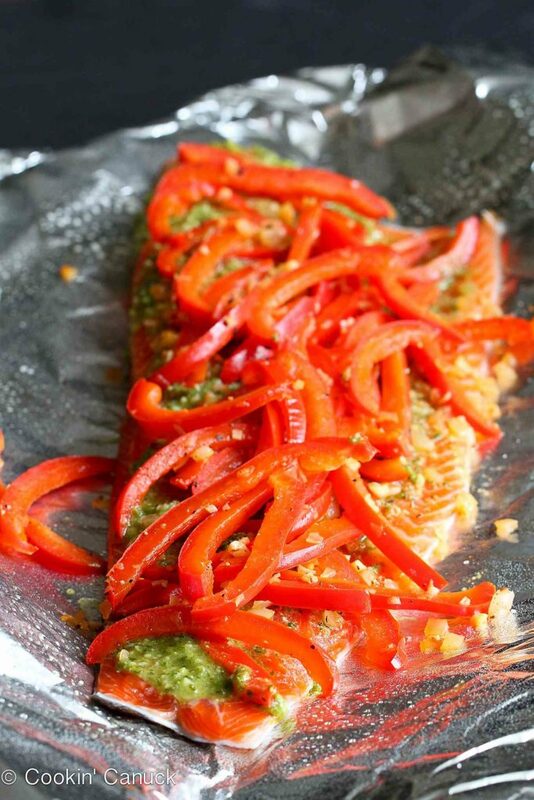 Love how easy and delicious this sounds Dara – grilling fish is one of my favorites during the summer. Love that tip to test doneness. Just added to my grilling Must Try list! I made this last night and it was fantastic! And it really couldn’t be any easier. Even my husband who swore that “Pesto is not his favorite” thought it was delicious. I did add a little red pepper flakes to the salmon, and topped it with some parmesan cheese when it came out of the oven (to woo the hubby) but those items really were not needed. I served it alongside some mashed potatoes. I will be making it again in the future. Thanks! when the cold weather hits here ( Montreal) , how long would you cook this in the oven? Great flavours! Thank you!